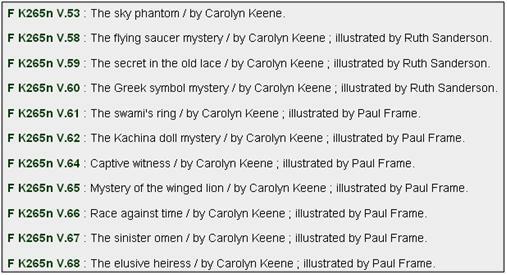 Identifying books that should be in the Zeta Collection. The Zeta Collection contains books intended for preschool (Easy books) through high school students. The records may have 6xx fields with ‘Juvenile literature’ or ‘Juvenile fiction’ subfields, and are more likely to have 520 (summary) notes than other monograph records. If they are purchased books, the location in the order record will often be “jlzet,” and they are generally ordered by Education. Junior Library Guild books: these books don’t have individual order records, as they are paid for all at once. Instead there’s a staff note added to the item record: z Purchased through the Junior Library Guild. Nonfiction Books: nonfiction intended for kindergarten to high school students. Biography/Autobiography Books: biographies and autobiographies intended for kindergarten to high school students. Note: the call number in the bibliographic record has no decimals or MARC subfield delimeters. If a biography, assign a work mark for the author. If an autobiography, there’s no work mark; instead the publication year is added to the end of the call #. If author/subject has published more than one book on themselves in the same year, then the work mark will include title of book and year published. Fiction Books: these books have more words than pictures and are typically novels. Note: the call number in the bibliographic record has no decimals or MARC subfield delimeters. Easy Books: intended for pre-school children, “E” books typically have many pictures and few words. Note: the call number in the bibliographic record has no decimals or MARC subfield delimeters. If a subsequent edition (a different publication year than the original), add the year of publication. Use the Cutter-Sanborn Three-Figure Author Table (in print or online: https://www.davignon.qc.ca/cutter.html) to find the correct cutter range for the author’s last name (or the biographee’s last name or the first word of the title). If using the print table, please be careful, as this book is old and one of the only copies left of it in the library. 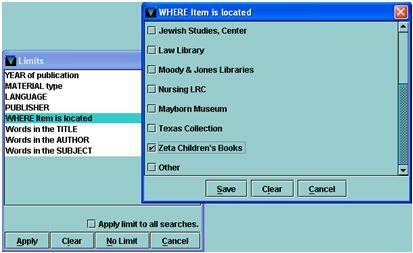 Search the online Zeta shelflist (the Dewey call number index, limited to the Zeta location) for the class number and the base cutter from the table. Adjust the cutter as needed, so that it fits alphabetically between the other author, biographee, and/or title cutters in that call number range. Reminder: we are only concerned with assigning the appropriate cutter within the particular Zeta class number range of the book we are cataloging. For example, both Charles Dickens and Frank Dickens have authored books in the Zeta Collection, but since Charles Dickens’ books are in the F class and Frank Dickens’ book is in the E class, they can have the exact same author cutter. However, if their books were both in the F class, they would have to have different cutters. Further, if Charles Dickens wrote books that fell in the B, E, and F classes, he could potentially have three different author cutters, depending on the existing cutters in those three class number ranges. Use the Cutter-Sanborn Three-Figure Author Table to determine the cutter base. In this case, it is B112, which should be used for authors with names from Bab to Babd. Search the Dewey call number index for class number and the cutter base—in this case, F B112, as it is fiction—limiting the search by the Zeta location. Use the Expand All button to see the titles and authors for each call number. If needed, adjust the cutter to file correctly within the existing books already in that call number range. For this example, we need to fit our book in between the ones by Lucy Babbitt (B1124 cutter) and Natalie Babbitt (B1125 cutter), so we can choose B11243. The first expansion system is to use the next letter of the word (or the first letter that is different than the previous title in the shelflist), so that the work mark is two or more letters. The other expansion system is to assign a letter and number combination similar to a cutter (but not necessarily consulting a cutter table). Use numbers 1 – 9, assigning lower numbers for letters at the beginning of the alphabet and higher numbers for letters towards the end of the alphabet. Determine which expansion system to use for a book by looking at what has been used with the other call numbers in that particular class number and cutter range. If no expansion system has been used in that range, use the first expansion system (using just letters and not numbers). Once you’ve determined which expansion system to use, then assign a work mark that will have the title or author file in correct alphabetical order, leaving space, if needed, for other work marks to be fit in. The vast majority of series in the Zeta Collection will be classed separately, but there are a few classed together series. Series that are classed together may have a cutter or work mark for the series title. If a series entered under author is classed together, all of the volumes will be cuttered for the author, assigned a work mark for the series title, then given a part or volume designation. If the classed together series is entered under title (as the series has multiple authors), then the cutter is for the series title, there is no work mark, and the call number ends with a part or volume designation. Change the call number in the item record to the corrected call number. Add a staff note (z): Reclassed from [former call number], [your initials], [date]. Fill out a slip, using the form below, put it in the book, and take to Marking. Put a tally mark for the book in all the applicable spots on the sheet for corrected books for each month.